Bringing the latest technology and the cleanest sweep by second to none. 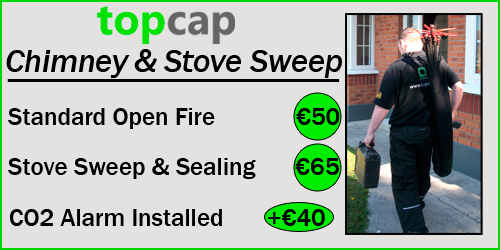 With every sweep, Top Cap technicians will discuss with its customers what fuels to use, how to get the most efficiency from your fire or stove, question you on your knowledge on carbon monoxide, fix minor repairs for free and write you a receipt! Because we stand by our work! With traditional sweeping rods you create surface tension, and the brush grabs the surface causing the flue to move while you are trying to sweep it. Should there be any build up in the flue this causes narrowing of the flue and even more surface tension making sweeping hard and causing movement in the flue you are sweeping. Surprisingly traditional sweeping is more dangerous to the structure of the chimney! When power sweeping, the brush head through centrifugal force expands to suite the flue you are sweeping, and it also centers itself because it is not a traditional brush so there is no surface tension being created in the sweeping process as the head adjusts to fit the flue width. We adjust the force of the sweeping action by increasing the speed of the drill and this has the effect of stiffening the brushing action ensuring you get the cleanest sweep. Top Cap’s rods are designed to be extremely flexible, so to pass with ease through the exit pipe of stoves and other fuel appliances, dramatically decreasing the chances of creating wear and tear, and bursting joints open. Pushing and forcing a solid sewer rod into your stove and through exist pipes and flexible flue-liners to access your flue, strongly increases your chances of bursting the joints open, allowing for gases to escape. This could end up being very costly and if not extremely dangerous due to the release of carbon monoxide poisoning. **Traditional rods are extremely dangerous to use on stoves for one main reasons! They are not flexible!